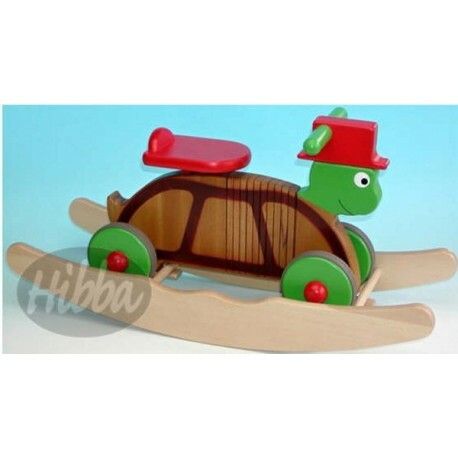 This rocking and ride on on wooden colourful turtle is our own new design and is manufactured by us under the Hibba brand. He is affectionately known as Tommy turtle and he promises that he will keep your kids busy ! WE KNOW YOU WILL FALL IN LOVE WITH THIS UNIQUE RIDE ON TOY AS SOON AS YOU OPEN THE BOX - WE CAN GUARANTEE THIS ! 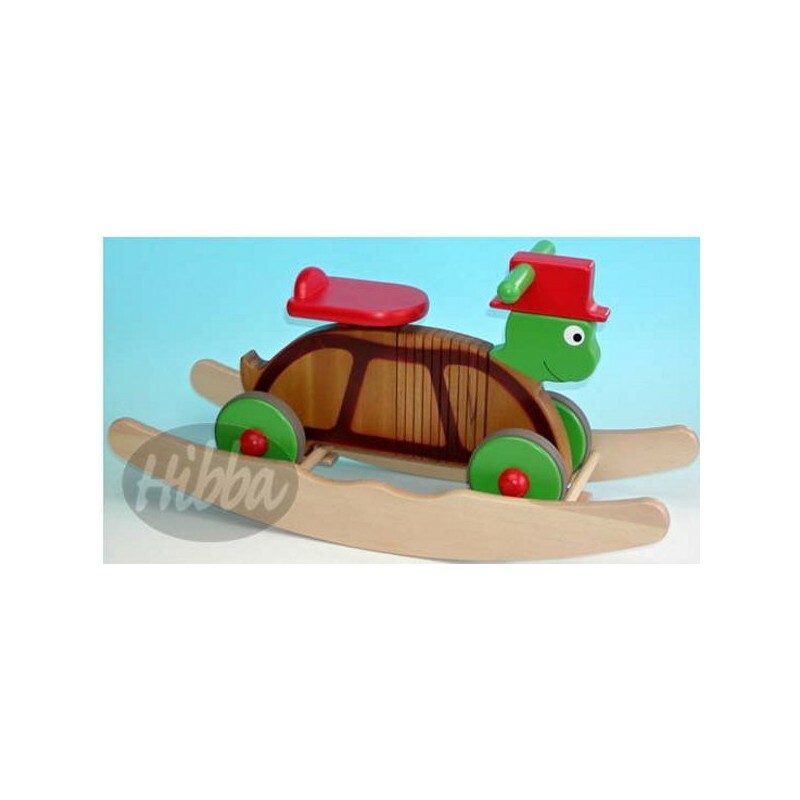 The wooden combi turtle is totally unique and superb because it rocks and also has wheels so it can be used as a ride on toy, 2 in 1. When the child is bored of rocking you can very easy remove the horse from the base so they can use it as a ride on toy. The pictures are not enough to emphasise the true quality of this toy. We know you will fall in love with this when you see him in real life. The striking red and green will make this toy very distinctive. We have carefully selected this delightful colourful turtle for its ingenious design and sheer quality. The turtle has a flexible wooden body which bends to allow the child to steer him. The front part of the body is made with a number of individual wooden pieces that have specially been joined together so that they flex and allow the child to steer. This is a great design without using any rubber or plastics. The turtle can be taken off the rocking base in order that it can be used as a ride on toy for fun riding around the house. The turtle has a lovely friendly face and will become best friends with your child. Crafted by hand by our master craftsman, this wooden ride on toy has been finished to an exceedingly high quality and specification. The wood used is a birch, and is from sustainable resources. This colourful red and green turtle designed combi rock and ride toy is very distinctive with a lovely soft sheen finish and is individually made with attention to detail and quality, which makes this a special and distinctive gift. The additional features include a rubber grip on the wheels so that it grips on the internal floor and does not leave any marks. We guarantee that you will not be disappointed with the quality and design of this product.